Sedums have become such a common sight in West Coast gardens that it’s easy to both take them for granted and think we know them. 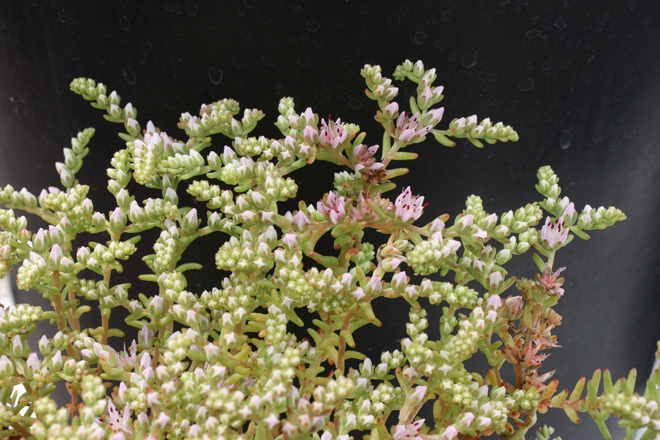 A widespread genus, Sedum species are found in Europe, North Africa, and Asia. There are even species endemic to Mexico and the western United States. In fact, one could postulate that we’ve been colonized by sedums—we just don’t know it. 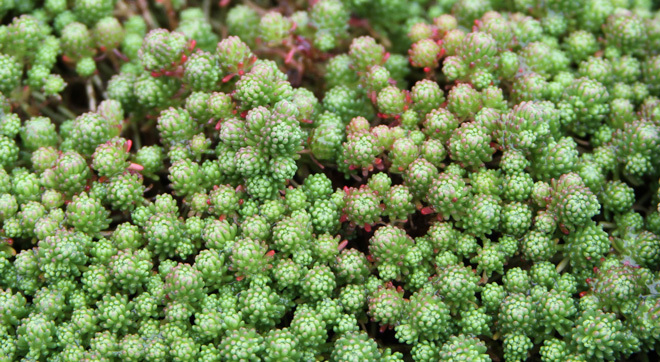 The term sedum is from the Latin word “sedo” meaning “to sit,” in reference to their ground-covering nature. 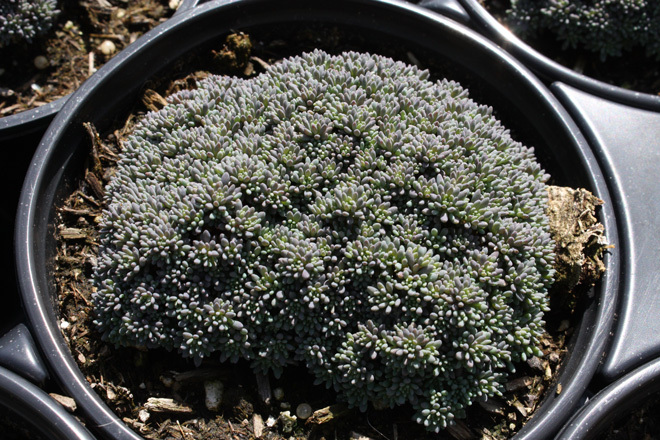 Sedums are quite diverse in form as well, being deciduous, semi-evergreen or evergreen, and taking the form of a perennial ground cover, sub-shrub, or shrub. The leaf form also reflects the great variety found among the 400 species in this genus. They have opposite, whorled, or alternate leaves that can be fleshy, flattened, or cylindrical. Add to this the great variety in tiny, star-shaped flowers, which appear in terminal panicles, cymes, or corymbs ranging in size from one-half inch to nearly ten inches and you get an idea of just how successful this genus has been. This article gathers together some of the more notable genera and varieties—organized by their natural growth habit—and offers ideas on how to landscape with them. The most popular use for low-growing sedums, this group can provide a carpet underneath other plants, cover an uninviting area with something tough and pretty, or add interest as a rock garden specimen. 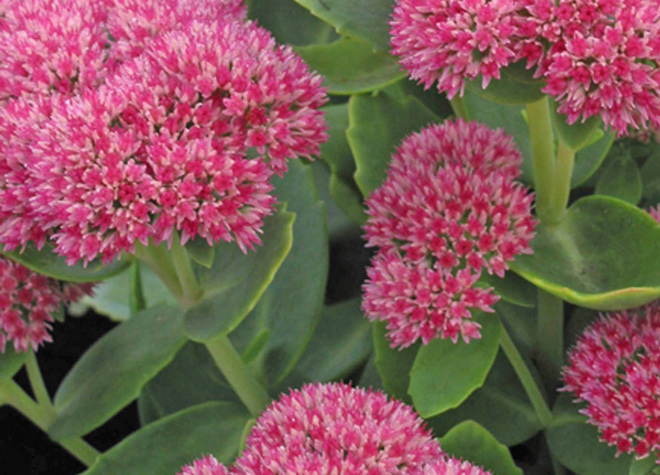 One of the most recognizable species is Sedum spurium (commonly known as two-row sedum). Excellent varieties include the aptly named dark red ‘Dragon’s Blood’ and the lovely ‘Tricolor’, which features grayish-green leaves bordered in pink and/or white. This evergreen, mat-forming species, native to the Caucasus region and northern Iran, has branching red stems and bright pink flowers. A single plant will easily spread to 2 feet over time. Equally popular is S. spathulifolium, a vigorous mat-forming type native to the American West. Branching, fleshy stems yield spoon-shaped silvery or green leaves to ¾-inch . 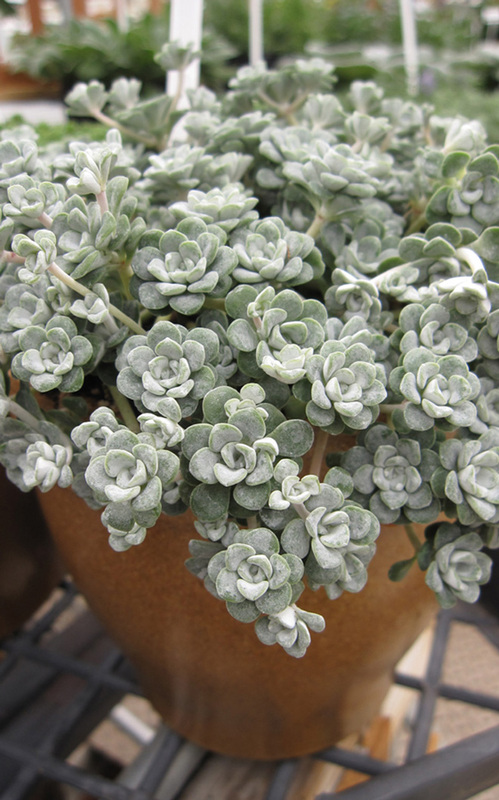 This species includes one of the most recognizable of all sedums, the ghostly ‘Cape Blanco’. Its silvery foliage is tinged red in the colder months, and when the yellow flowers pop up like golden eruptions in summer, the contrast is striking. Such is the case with the equally lovely silver and burgundy-leaved S. s. ‘Purpureum’. It may seem odd to have a sedum called October daphne, but one look at the sensuous, pink-rimmed glaucous leaves of Sedum sieboldii and you can understand someone getting carried away. Though a modest size, 4 inches tall and 8 inches wide, the ethereal leaves and star-shaped pink flowers make this species a distinctive treat. Speaking of distinctive, one look at the dense, sea green, cup-shaped foliage of Sedum tetractinum and you get an idea how it came by its name ‘Coral Reef’. Hugging the ground and offering bright yellow summer flowers, it only gets more beautiful when the leaves turn an exquisite cinnamon-bronze in the fall. Sometimes you want a ground cover to completely blanket an area to create a kind of “dry river” effect. Enter S. hispanicum ‘Blue Carpet’. It features fine-textured, bluish-gray leaves that, from a distance, do indeed resemble a living carpet. In the colder months, the foliage turns a lovely purplish hue. Though the yellow flowers are indeed pretty, this is one sedum that almost looks better without them. Like many perennials, upright sedums add color and texture to garden beds, provide contrast to spiny or grassy dry garden plants, or can serve as a focal point in a container. For an upright sedum that’s both common and spectacular, it’s hard to beat Sedum spectabile ‘Autumn Joy’ (‘Herbstfreude’). Its common name is also its nifty trick. 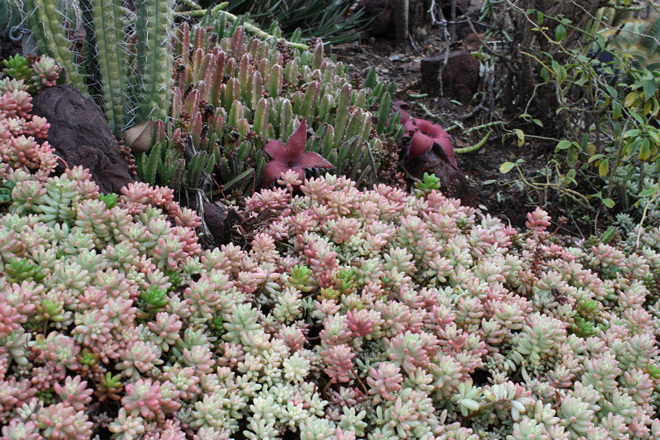 This 2-foot-high deciduous succulent begins to bloom in the summer, producing large heads of tiny green flowers. As the summer ends, these flowers transition to a bright pink and that’s when the bees arrive in full force. 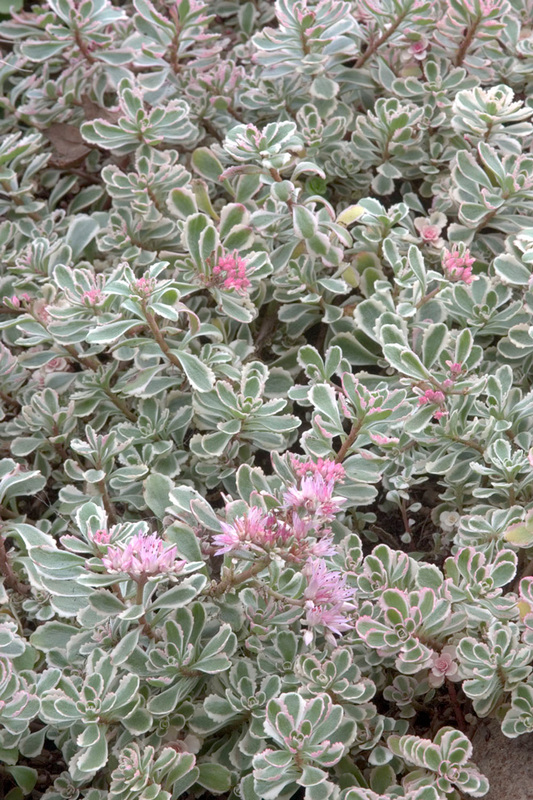 In contrast, foliage is the main attraction for coppertone stonecrop, S. nussbaumerianum. 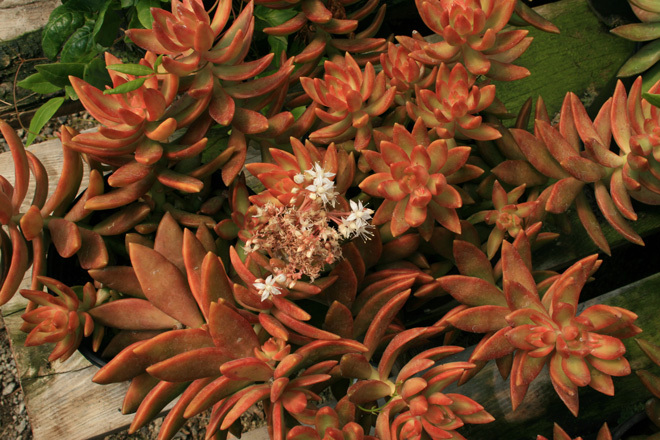 Boasting 8-inch tall branches of golden-orange, upturned cylindrical petal-like leaves, this sun-loving sedum’s warm colors add a glow to any bed or mixed succulent bowl. 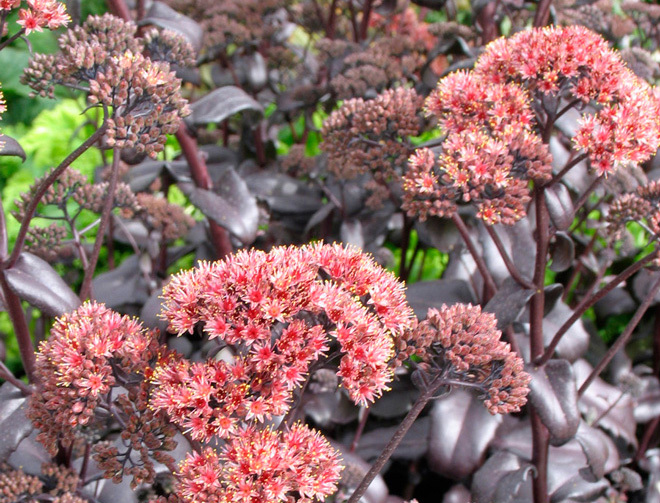 Sedum ‘Postman’s Pride’ rewards the gardener with deep bluish-purple ovate leaves on a 2-foot-high, semi-upright compact bush. In late summer, the plant bursts forth with a matching inflorescence of purple flowers, which dry to a dark burgundy in fall. No less dramatic is the otherworldly bluish-purple foliage of S. telephium, a 2-foot high, deciduous perennial that hails from China and Japan. Choose the cultivar ‘Matrona’, which features red stems or ‘Atropurpureum’ for dark purple branches. Both add pink flowers in summer. 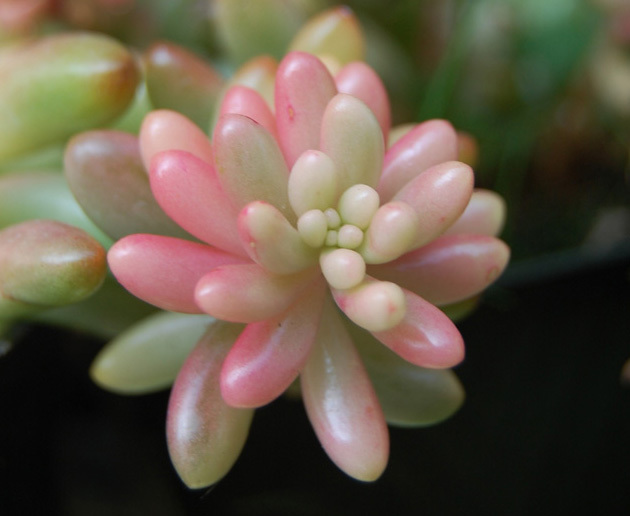 And for those with a sweet tooth, you’ll want to add some jellybeans to your sedum collection. That would be S. rubrotinctum, sometimes also known as pork and beans. 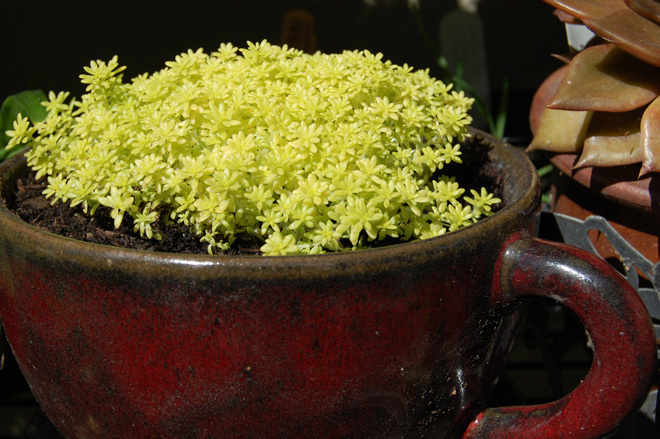 While this 6-inch-high evergreen succulent can certainly be used as a ground cover, this cute little guy is so charming you may want to put it front and center in a container in order to show off its luminescent colors. Sedums make excellent cascading plants, whether used in a hanging basket or spilling over a low wall. Selections featured here will spread fairly quickly and fill in quite densely. They can even be used as an indoor hanging basket. European native S. rupestre ‘Angelina’ is a favorite for many, providing golden foliage and pretty yellow flowers in summer. Sedum morganianum may not ring a bell but if you say “burro’s tail” chances are many a gardener will nod in recognition. Showcasing bluish-green, oblong, fleshy leaves that hang in long chains, this is a classic hanging basket sedum. It’s an import from south of the border but has made itself at home in many a garden. The delicate S. lineare ‘Sea Urchin’ features tiny, variegated leaves of mint green, edged in creamy white. The uniquely textured foliage of ‘Sea Urchin’ adds a distinctive look to any container. It is best appreciated up close and personal. I have mine spilling out of a large ceramic teacup, giving it a Mad Hatter tea party kind of look.